I have been working all day on sermon notes and liturgical resources for the first two Sundays in November, which include two successive readings that summarise the story of Ruth. Because the first of these Sundays may be celebrated in many parishes as ‘All Saints’ Sunday’ (4 November 2018) and the second marked as Remembrance Sunday (11 November 2018), many people in parishes may not hear the story of Ruth. Ruth abandons her home and her traditional religion, marries Boaz and becomes a Jew by choice. Ruth and Boaz are the parents of Obed, who is the father of Jesse, and Jesse is the father of David, Israel’s greatest king. She is one of only five women mentioned in the genealogy of Jesus, along with Tamar, Rahab, Bathsheba and Mary (see Matthew 1:1-16). Ruth’s story is an important illustration of interfaith marriage and challenges the tradition that Jewish identity is conveyed only through matrilineal descent. 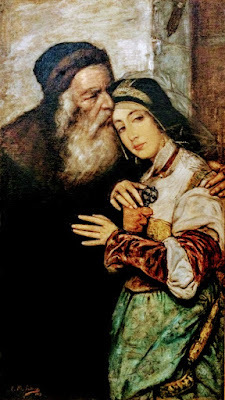 In my search for images to illustrate the story of Ruth, I came across a copy of the painting Shylock and Jessica, by Maurycy Gottlieb, which I photographed in the Jewish Museum in the Old Synagogue in Kraków almost two years ago. 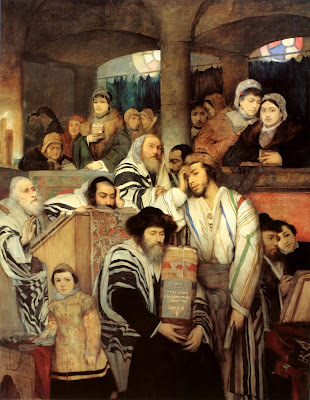 Maurycy Gottlieb (1856-1879) was a Polish Jewish realist painter of the Romantic period who was, perhaps, the most famous Jewish painter of his age. He was born in Drohobych to a wealthy, Yiddish and Polish-speaking orthodox Jewish family. Drohobych in Galicia was then part of the Austrian sector of partitioned Poland, but is now in western Ukraine. Maurycy (Moses) Gottlieb was one of the 11 children of Isaac Gottlieb and his wife Fanya (née Tigerman). At the age of 15, he enrolled in the Vienna Fine Arts Academy, and in 1873 he went to Kraków to study under Jan Matejko. 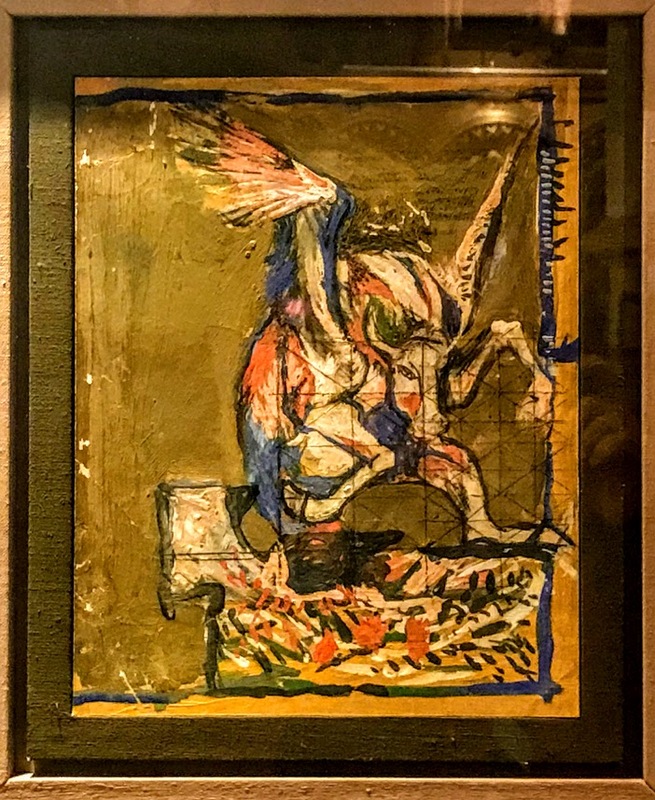 There he became a close friend of Jacek Malczewski. However, an anti-semitic incident at the School of Fine Arts prompted Gottlieb to leave Kraków after less than a year, in spite of Malczewski’s protests. He visited Norway and Vienna, and then moved to Munich in 1875 to study. In 1876, he won the Gold Medal at the Munich Academy for this painting, Shylock and Jessica, a painting inspired by a scene in Shakespeare’s The Merchant of Venice. This too is a story of heartbreak and conversion, and some ways is a reversion of the story of Ruth. Jessica converts to Christianity in act of abandonment that brings to end the line of Jewish descent in Shylock’s family. When Lancelot the clown says Jessica is ‘damned’ because she is the ‘Jew's daughter,’ Jessica declares ‘I shall be saved by my husband. He hath made me a Christian’ (3.5.18-19). To be ashamed to be my father's child? Gottlieb based Jessica’s face on Laura Rosenfeld (1857-1944), to whom he had proposed marriage. When the painting was exhibited in Lviv (1877) and Warsaw (1878), it received wide acclaim. Laura was also one of 11 children, the daughter of Joseph Rosenfeld and his wife Rosa (née Kolisch) of Brno. Laura was sent to convent schools in Lienz and Geneva, but continued to adhere to the Jewish faith instilled in her by her mother. When her father died, her widowed mother moved with her to Vienna, where she first met Maurycy, in 1875 or 1876. Maurycy was smitten by Laura, and he soon proposed to her. They became engaged and she became the subject of many of his paintings, including Portrait of Laura, Jews Praying in the Synagogue on Yom Kippur, Shylock and Jessica, Uriel Acosta and Judith. Meanwhile, in those two years while he was living in Vienna, he worked on paintings with biblical themes and produced book illustrations. After visiting Rome in 1878, Gottlieb returned to Kraków, where he worked on a new project, a series of monumental paintings including scenes from the history of the Jews in Poland. As he continued to travel, Laura began to lose interest in him. He sensed her distance in their letters and became more and more anxious, until Laura finally confessed she had fallen in love with someone else. Gottlieb died on 17 July 1879, according to some, of a broken heart, intentionally letting his health fail, due to his despair over this failed romance and Laura’s new-found love. 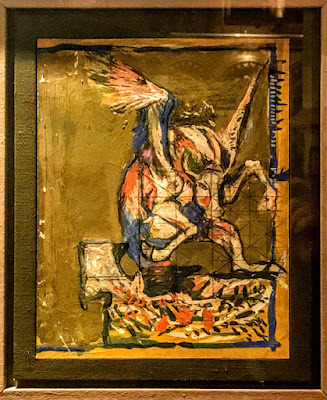 He expressed his heartbroken feelings of despair in his letters to Laura and in his painting Jews Praying in the Synagogue on Yom Kippur, where he has placed his own name on the memorial inscription on the Torah mantle. Despite his premature death at the age of 23, more than 300 of his works survive although not all are finished. But what happened to Laura Rosenfeld? Laura married Leo Henschel (1850-1909) and they had four daughters. While Laura ran a busy family home in Berlin household, she continued to read and study. After her husband died in 1909 and her children had left home, Laura dedicated her life to education and social work. She worked in an orphanage for children of criminals, as a social worker, and set up a communal home near Berlin that stressed harmony and equality among the residents. She was also active in feminist and human rights movements. With the rise of the Nazis, she fled to the Netherlands in 1933, and there she lived in The Hague. For a time, she was hidden by a friend in the east Netherlands until she was betrayed. She was 86, paralysed and almost blind, when she was sent to Westerbork, a transit camp in the Netherlands, and from there to Auschwitz-Birkenau. The last known record of her is on 4 April 1944. Her family genealogical accounts say she was murdered in Auschwitz on 8 April 1944. Her eldest daughter, the sculptor Margarete Steiner-Henschel, was murdered in Auschwitz on 31 August 1944. Laura and her daughter Margarete are commemorated on a memorial monument in Zeist in the east Netherlands. In the Church Calendar, today [18 October] is the Feast of Saint Luke (Λουκάς) the Evangelist, traditionally remembered as the author of the Third Gospel and of the Acts of the Apostles. 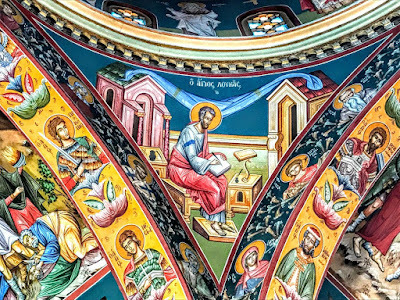 I have never quite worked out why Saint Luke among the four evangelists is traditionally represented in Church art and architecture as a winged ox. But I find he is an interesting Biblical figure, not just as an evangelist, but as a writer who provided fascinating accounts of his travels – in all, he names 32 countries, 54 cities and nine islands – and as a key figure in the tradition of icons and iconography. Although Saint Luke is not one of the Twelve, he figures throughout the New Testament. Apart from the Gospel he gives his name to and the Acts of the Apostles, he is also mentioned in the Epistle to Philemon (verse 24), Colossians (4: 14) and II Timothy (4: 11), which is part of the Epistle reading in the Lectionary readings for today. Later traditions claim Saint Luke is one of the Seventy at the heart of the Gospel reading today, that he is one of the disciples on the road to Emmaus, or even that he is closely related to the Apostle Paul. But Saint Luke, in his own statement at the beginning of the Acts of the Apostles, tells us he was not an eyewitness to the events of the Gospel. On the other hand, he repeatedly uses the word ‘we’ as he describes Saint Paul’s missionary journeys in the Acts of the Apostles, indicating he was personally there so many times. Yet, both the Gospel according to Saint Luke and the Acts of the Apostles are detailed in history, expression, and narrative that are held in regard by Biblical historians and archaeologists for their historical accuracy and trustworthiness. Saint Luke is also known as the ‘glorious physician,’ and – especially in the Eastern Church – as an icon writer. It is said that Saint Luke was born in Antioch in Syria (now in Turkey) to Greek-speaking parents. As a physician, he was said to have had a skill for healing, but that he left all this behind around the year 50 AD and joined Saint Paul after they met in Antioch. He may have accompanied Saint Paul on his missionary journeys before staying on in Troas (Troy) after Saint Paul’s departure, although it is also possible that he was with Saint Paul in Rome until Saint Paul was martyred (see II Timothy 4: 11; Acts 28: 16). Tradition says Saint Luke died in Thebes, in central Greece, at the age of 84. Saint Luke gives us the great poetry of the canticles Magnificat (Luke 1: 46-55), Benedictus (Luke 1: 68-79) and Nunc Dimittis (Luke 2: 29-32). Saint Luke alone gives us the Annunciation, the Visitation, the birth of Saint John the Baptist, and the Presentation of the Christ Child in the Temple. Saint Luke introduces us to Elizabeth and Zechariah, the angels and the shepherds at the first Christmas, Simeon and Anna, the Christ Child lost in the Temple, the Good Samaritan, the unjust steward, the Prodigal Son, the healed Samaritan, Zacchaeus the tax-collector in Jericho, and the Disciples on the Road to Emmaus. Saint Luke devotes significantly more attention to women. He presents Christ as the constant friend of the poor, the down-trodden, the marginalised, the side-lined, healing the sick, comforting even the despairing thief on the cross beside him. As I arm challenged by the ways of the world, I sometimes wonder how – like Saint Luke the Gospel writer and Saint Luke the Iconographer – I can present the world with meaningful and accessible accounts and images of who Christ is. As I remain committed to mission in the work of the Anglican mission agency USPG, I find inspiration in the commitment of Saint Luke the early missionary, with his accounts of the missionary work of the early Church. Without Saint Luke, it wonder how we would have come to know about the earliest missionary endeavours of Saint Paul and the Apostolic Church. Saint Luke remains an attractive and interesting Biblical figure ... as an evangelist, as someone who presents Christ in ways that can be understood in the language of the people, whether word or image, as someone who gives healing a proper place in ministry, as a friend of the poor and the sick, the marginalised and the stereotyped, as someone who, in all his travels and travails, remains faithful unto death to the ministry he is called to and is charged with. Readings: Isaiah 35: 3-6 or Acts 16: 6-12a; Psalm 147: 1-7; II Timothy 4: 5-17; Luke 10: 1-9.